Conservation and environmental jobs account for between 1 and 3 percent of total U.S. employment, and educational options for this field have grown significantly in recent years. According to U.S. News & World Report, there are now some 515 colleges that offer degrees in natural resources and conservation fields, 266 that offer environmental sciences programs, and 241 that offer environmental studies programs. 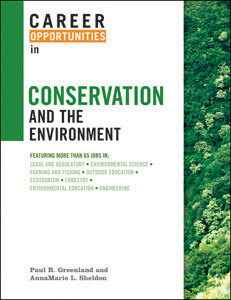 Career Opportunities in Conservation and the Environment offers 69 profiles of careers in these flourishing areas. Cutting across several broad industriessuch as agriculture, education, engineering, law, and sciencejobs in conservation and the environment can be found in such diverse settings as nonprofits, government agencies, educational institutions, hospitals, utilities, and other public and private businesses. Paul R. Greenland is a writer and editor specializing in business and general nonfiction reference works. He formerly served as senior editor of Sales and Marketing Strategies & News, a national business magazine. He has edited or contributed to many reference works, including The Encyclopedia of Chicago, The Encyclopedia of American Industries, and The Encyclopedia of Global Industries. In addition to his editorial background, Greenland has extensive experience in the health care industry, and in the fields of human resources management and marketing. AnnaMarie L. Sheldon is a freelance business and education writer and editor. She has edited or contributed to many reference works, including Industry Resources Handbook, E-Commerce Sourcebook, The Encyclopedia of American Industries, and The Encyclopedia of Global Industries. Sheldon has also developed and written a series of career preparation guides now used statewide by Michigan’s intermediate school districts. "...a practical, easy-to-use guide...an up-to-date and very helpful reference tool that belongs in all high school, undergraduate, and employment agency libraries. It is also worth considering by public libraries where there is a demand for occupational information." "...a must-have for any wildlife rehabilitator, wildlife center, nature center, or university library...provid[es] career information accurately."